I should have been with our son and his family in London today, Christmas Day, but with chicken pox raging there, we decided to stay home. I took a quiet walk through the main street. Hardly a soul. A few men, a dog or two and one couple with a child in a pram. Every shop had sale notices plastered on the windows, some even promising savings of up to 70% ! What mark-ups have there been to allow for such discounts? One wonders. Being the most average size out, if I want a bargain, I’d better hurry tomorrow morning! This is, indeed a day of rest. I paused by the Minster. Yesterday evening, on Christmas Eve, there was already a long queue outside at 6.45 when the doors opened for the Nine Lessons and Carols at 7.30. The church was already half full by the time we entered, and soon after 7 the aisles were crammed and there was standing room only. Just as in the 14th century when it was almost completed. There must have been nearly 500 people. They sang heartily, listened silently (except for some snuffles and the queries of children) to the carols and the lessons read by choristers and clergy, and filed out happily, sent on their way on the sonorous sounds of the 18th-century organ. Thus Christmas began. Standing outside the Minster this Christmas morning I thought about a bankrupt composer in London in 1741.He had been writing operas with little success. He turned to oratorios, but still his luck was out. He was ill, probably had a stroke and, aged 56; the future didn’t seem to hold out much hope. An invitation to visit Ireland came at the same time as his librettist submitted the text for an oratorio compiled from the Bible. He wrote music for the 53 sections in 24 days and the Messiah was born. 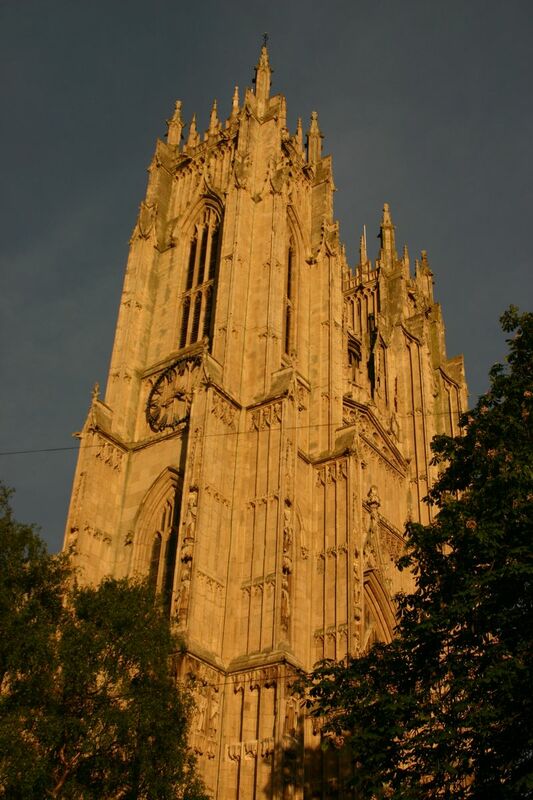 It is performed in the Minster every Christmas. In the quieter parts towards the end, the audience near us began looking irritatedly at an elderly woman in the aisle. She was humming, ecstatic and oblivious. I somehow think Handel might have approved!